Located at 162 Jozo Weider Boulevard in Blue Mountains Village in Ontario, near the town of Collingwood, Firehall Pizza Co. is a nice Italian place where anyone can enjoy a cosy, friendly atmosphere over a nice cold beer, fine Italian pasta and pizzas, burgers, and, on occasion, live music. 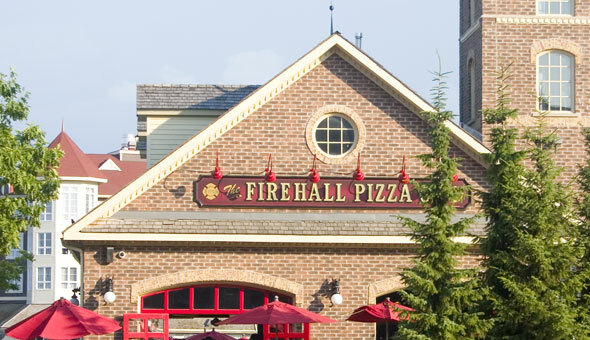 The Firehall Pizza Co operates as a part of the Blue Mountains resort and is located almost in the centre of things. The many activities offered by the surrounding area and resort attract a varied clientele, and anyone craving Italian food or pizza, or a burger with fresh ingredients should come for a visit. The Firehall Pizza Co. opens its doors for business each day at 11 AM sharp and stays open until 9 PM on Monday till Thursday, until 10 PM on Friday, 10.30 PM on Saturday and until 2 AM on Sunday. The place caters to families, large crowds, welcomes kids and offers a lot more amenities one can expect from a casual dining establishment. Many of the clients that have enjoyed the menu and atmosphere at Firehall Pizza Co. have shared their experiences on Yelp, Trip Advisor, Facebook, and Google Reviews, and I have made a list of the main pros and cons mentioned more often. The Firehall Pizza Co has been serving good Italian meals in the Blue Mountains since 2003. The inspiration for the building was northern-Ontario fire halls which are one large room with huge red doors. The fire hall vibe is felt and seen everywhere you look, with a red fire hydrant conveniently placed on the bar and nice-looking red windows. The décor is mainly wood with suitable decoration for such an establishment, lots of wooden accents and conveniently placed TV sets that display sporting events. The dishes served in the Firehall Pizza CO. are based on the Italian cuisine, with lots of Canadian influences. There is a separate kids menu, and many vegetarian, vegan and even gluten-free options. The prices are relatively affordable, and there is a nice selection of beers, wines and several cocktail options. Firehall Pizza Co. has indoor and outdoor seating when the weather allows it, and the outside seating offers a pleasant view of the Mill Pond. The establishment has a private parking lot and is wheelchair accessible. Whenever you are in the Blue Mountain Village, be sure to check out this place and enjoy a meal at the Firehall, as it proudly holds a position among the top 10 restaurants in the Blue Mountains.